First appearing in 1971 in Hasbro’s Playskool range, Weebles were an incredibly popular toy with their novel weighting mechanism. "Weebles wobble, but they don't fall down" was the catchphrase that captured the imagination of kids throughout the seventies. Various incarnations of these toys over succeeding years saw their popularity wane and rise, but never disappear. 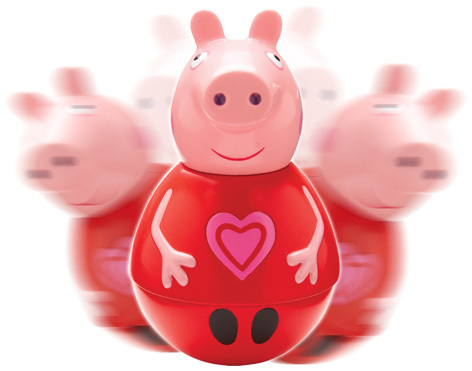 Character Options purchased the licence in 2013 and launched new Weebles toys based on the popular Peppa Pig characters. Featuring the trademarked round bottomed bases, Peppa and her brother George, as well as Mummy and Daddy Pigs all get the wobbling treatment. Playsets including cars and trains complete the collections that are designed for children as young as 18 months old. Children should also watch out for other Peppa Pig characters like Suzy Sheep, Candy Cat, Pedro Pony and even Emily Elephant. The Weebles Farm introduced lots of new wobbly characters and vehicles to further enchant and amuse the fans of these unique little toys. The Wobbily Tractor can pull along the connecting Hay Bales, Milk Churn and Wool Sacks trailers, whilst new figures include Fluffy The Sheep, Dapples the Horse and Nugget the Chicken. Fans of the Teletubbies are thrilled that their favourite characters have also been made into Weebles. 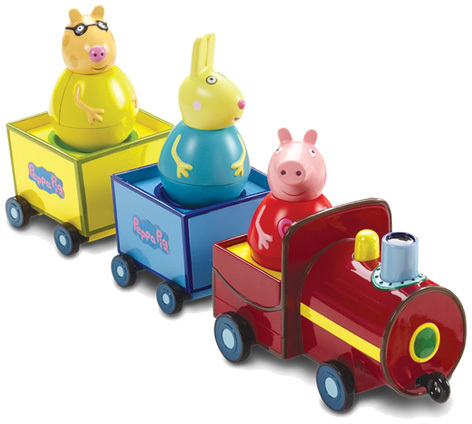 Along with the pull along Wobbily Custard Train, these famous TV stars make great collectable toys.